After sharing with the breast cancer community Micheal Greger, MD’s post Which Fruit Fights Cancer Better? we wanted to follow up with a recipe that included the top fruits that slow cancer cell growth. If you didn’t get a chance to read this researched based article the two best fruits are cranberries and lemons along walnuts which will be featured this week. Place the cashews, coconut oil, wine, lemon juice and salt into a high-speed blender and begin to mix until smooth. Add 1 tablespoon of water at a time if it is too thick to blend. You shouldn’t need more than 2 Tbsp. of water most likely. Add the cranberries and only ¼ c. of the walnuts to roughly blend for a couple of seconds. Line a bowl with plastic wrap as pictured above and spoon the cheese sauce inside. Wrap the top up securely and place in the freezer for 1 hours until it begins to set. Take the cheese out of the plastic wrap and in a shallow bowl place the remaining ½ c. chopped walnuts in and gently roll the cheese ball around until it is completely covered in walnuts. Wrap in a clean piece of plastic wrap, placing it back in the bowl and into the freezer for another hour. 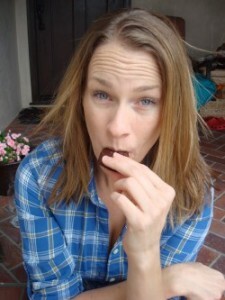 Native of Los Angeles, Cara is the crazy, chocolate-filled woman behind Fork & Beans. On a mission to recreate every treat known to mankind, she has every intention of making them gluten, egg, and dairy-free. Oh, and super tasty too. From a range of Girl Scout Cookies, homemade candy bars, to a collection of childhood favorite snacks–nothing is off-limits. You can follow Fork & Beans on Facebook, Pinterest, and Instagram. You can also pre-order the upcoming published cookbook Decadent Gluten-free Vegan Baking here. Hi, just curious what type of wine and how much do you put in this recipe? It’s not included in the ingredient list, but is mentioned in the instructions. Thanks so much!